Ever have to sort through a pile of unmarked LF EM4100/EM4102/Unique RFID tags sitting on your desk, or need to quickly determine the ID of a tag before programming it into your latest RFID project? Well, the guys over at CoreRFID were nice enough to send me one of their spiffy little USB readers. Turns out it’s a very handy (and portable) little reader that works with all sorts of LF tag form factors. The great thing about this reader is that it acts like a standard USB HID keyboard, meaning there’s drivers to load or funny business to go through. Just plug it in, read a tag, and it “types” out the ID as if you’d typed it yourself on the keyboard. You can pop open your favorite text editor or put the cursor into a text field of a desktop or web application and this reader will type out the tag ID plain and simple. 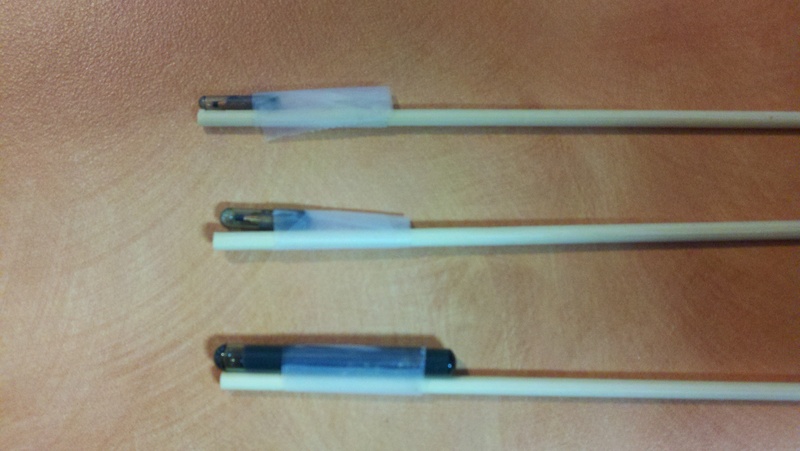 To make it easier to get an accurate measurement, I taped the tags to wooden skewers and slid the skewers down a nearby all=plastic ruler. The results were encouraging! First, my results. 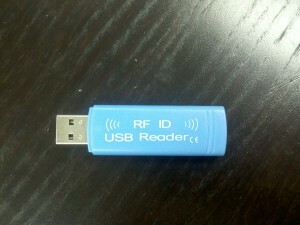 Then some additional notes you’ll want to read if you are interested in using this reader with an implanted glass tag. The antenna coil in this little reader is at the very end of the stick, but oriented toward the side with the writing (the top side I guess you could call it). Reading tags from head-on (where the LED shines out from) or the bottom/back side does not produce desired results. Testing quickly revealed that there may be some tuning or field stability issues with the reader. After some quick successful test reads of the large RF card, I tried to read a 2x12mm glass tag. 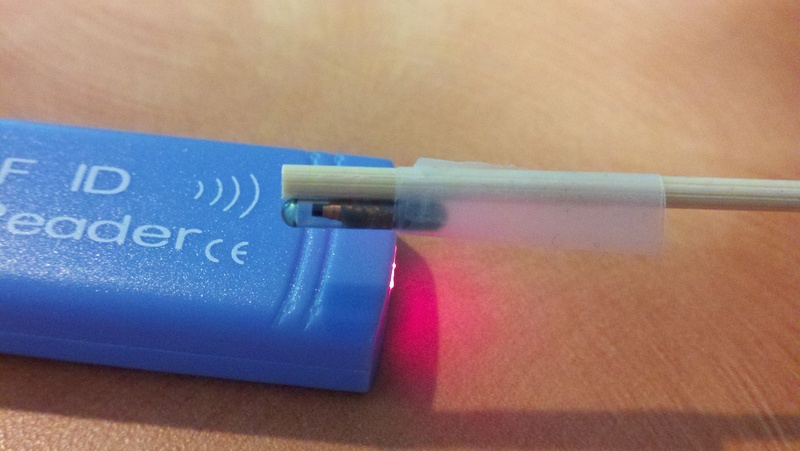 At first I was unable to get a read of any kind with a 2x12mm tag, even if put in direct contact with the reader. I changed the orientation of the 2x12mm, standing it on end directly over the reader coil and tried to get a read. After a couple passes and re-orienting it back down parallel with the reader coil, it started getting a reading at 1mm. Slowly over the course of about 10 seconds I was able to get it reading at 4mm, but it finally settled down around 2mm. Read ranges for other tag types were fairly stable. I then tested the reader on my left hand, implanted with a 3x13mm EM4102 glass tag. Hovering the reader about 1mm over my skin was able to produce a read without much difficulty, but actually placing the reader in contact with my hand got the best results. 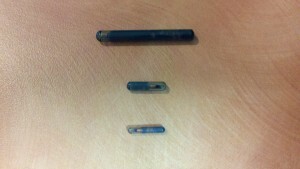 I then took the reader to a willing test subject who is implanted with a 2x12mm EM4102. Unfortunately, the reader was unable to read the 2x12mm implanted tag no matter what orientation we tried or how deep we pressed the reader into the fleshy bits between the thumb and index finger. It appears the interference created by the body surrounding the tag may just be too great to properly read an implanted 2x12mm tag. Your results may very however. Overall this is a great little reader that is definitely worth the price. It’s easily thrown in your pocket or bag, and can very quickly be plugged in and used immediately with any computer, thin client, or device that expects to talk to a USB keyboard. I even tried it with a funky Axis 70u document scanner, which could open up a whole new world of document management options if one were to stick adhesive RFID stickers to documents and use RF to track them in an office or document archive. This entry was posted on Sunday, July 24th, 2011 at 1:37 pm	and is filed under Adventures in RFID, Reviews. You can follow any responses to this entry through the RSS 2.0 feed. You can leave a response, or trackback from your own site.